This dish is easy to make and will definitely perk up your dinner or party. Baked fish is perfect for indoor dining and can be served with mushrooms or green leafy vegetables. Salmon also makes a great partner for lettuce salad or veggie bites. This is a weekend or midweek must and a tender treat for your family. 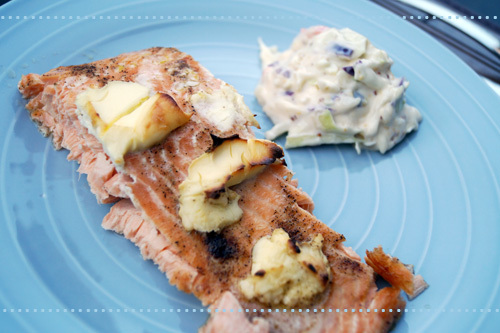 It is a good source of protein and vitamin B and a cheesy and creamy twist to classic recipes. A slightly heavier remake of baked salmon, this dish is a great centerpiece for a formal or special occasion. Preheat the oven to 400 F or 200 C. Pour the olive oil in a baking tray and place the salmon steaks. Season with lemon juice and salt and pepper. Combine garlic with cream cheese and milk and mix well. You can microwave the cream cheese for about 30 seconds so that it is easy to spread. Spread the mix over the salmon steaks. Add the Parmesan on top of the cream cheese. Bake for about 20 - 25 minutes. It may cook longer depending on the thickness of the salmon steaks. Garnish with chives and serve. Optionally, you can serve with coleslaw.